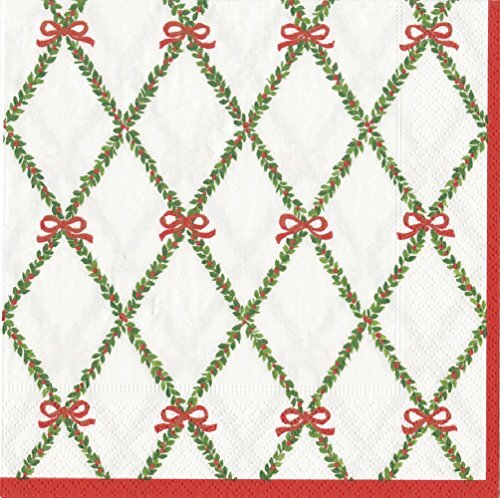 Entertaining with Caspari garland trellis luncheon napkins, pack of 20. Dress up your table everyday by adding a touch of elegance. Our beautifully designed luncheon napkins are the perfect decorative accent to make your table a place your guests will want to linger. Our luncheon napkins are printed in Germany using non-toxic, water-soluble dyes, making them biodegradable and compostable. Disposability makes clean-up a snap so you have more time to enjoy the party. The soft, yet strong 3-ply tissue has the look and feel of linen without the maintenance. Each individually folded napkin measures 6-1/2-inch square and opens to 13-inch square. Finish the look with other items from our coordinating high-end paper table top collection. Includes paper plates, additional napkins, guest towels and cups - finally, add our acrylic stemware and top quality pillar and taper candles. Caspari-bringing beauty, style and convenience into your home every day.